Can any good come out of a lie? Not a malicious lie mind you. Oh no. Nothing like that. But rather a lie in which 'Person A' tries to protect 'Person B' because they care for them so much. You know, just like something depicted in this film Directed by Raja Gosnell; and Starring: Martin Lawrence, Paul Giamatti, Nia Long, Anthony Anderson, and Terrence Howard. It was made in 2000, and lasts for 98 minutes. FBI agent, Malcolm Turner (Martin Lawrence), has a very unusual problem on his hands. No. Don't worry. He knows that his partner, John Maxwell (Paul Giamatti), is loosing his hair. 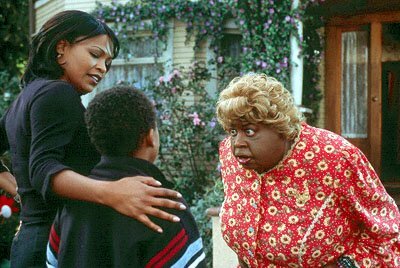 Instead, Malcolm's dilemma is because he has been instructed to survey the house belonging to and old fat black woman called 'Big Momma' (Ella Mitchell), only to end up turning into her and then falling in love with her long lost niece, Sherry Pierce (Nia Long). Alright, I know that does sound very-very strange. However, the thing is, Sherry's ex-partner, Lester Vescro (Terrence Howard), recently broke out of prison and is looking for Sherry, because she has some stolen money belonging to him, that he does not know she has in her possession. Moreover, when 'Big Momma' is called away on matters of the heart, out of the blue, Sherry suddenly turns up, prompting Malcolm to quickly take Momma's place with some additional cosmetic dabbling. OK, so do you get the bigger picture now, dear reader? Yes! Thank God. Just like Sherry and her son, Trent (Jascha Washington), when they go to church with Momma / Malcolm, and carry on a 'normal family'. You know the type of thing I'm sure. They go shopping together. They deliver babies together. They play basketball together. They go to judo together. And they get ogled by Momma's boyfriend together too. Though, some of the things they don't do together, is when Malcolm checks in with John from time to time, and hears the news that Lester and Momma are on their way home. Ouch! That's most probably why what next transpires kick's off when the security guard called Terry (Anthony Anderson) grabs some nuts. As paths collide - beware of the bride - lies are shied - and a priests can not help but turn the tied. It is a little known fact that the screenwriter of 'Big Momma's House', Darryl Quarles, first came up with the idea behind this flick, because this was the name that the neighborhood kids gave his own very mother. However, a small part of me does wonder what would have happened if they called his Mum something like 'Batman verses Mary Poppins' (click here for review)? Or what about 'A platform to showcase the cartoon-like talents of Martin Laurence'? Well? Could it work I suppose. And it did -- in part. But before I give you my 411 on this crime comedy caper, please check out these filmic facts first. (1) In 1999 Martin Lawrence slipped into a coma after collapsing from heat exhaustion while jogging. (2) Ella Mitchell was an un-credited singer in the film 'Lord Shango'. (3) Terrence Howard saw his father stab a man in self-defense when he was three years old. He served eleven months for manslaughter. (4) Paul Giamatti's father was once the president of Yale University. (5) Nia Long is a fully registered Girl Scout. (6) Jascha Washington's first role was in the television series 'Brooklyn South'. (7) Martin was arrested at Burbank Airport in 1996 for carrying a loaded gun in his suitcase. (8) In 2000 Nia was voted one of the 50 most beautiful people in the World by 'People Magazine'. (9) Paul has both Italian and Irish blood running through his veins. (10) Terrance has a degree in Chemical Engineering. And (11) Ella was interviewed by David Frost in the seventies. 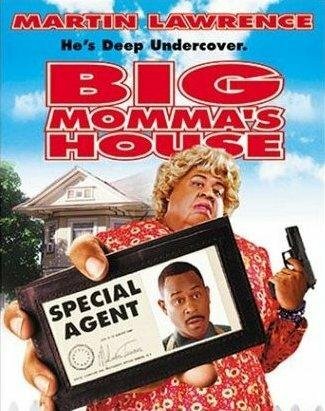 OK, so now I have all of that out of my system, let me just say 'Big Momma's House' is a movie which in some way is exactly like the pretext it's trying to convey -- it has too much padding on. You see, what I mean by this, is just like the prosthetic Martin Lawrence's character wears in this film, this film itself is cosmetic in substance and bulky in tone. Conceptually speaking of course -- plot wise -- most of this movie is basically ‘filler’ so Martin can clown around and play ‘Big Momma’ whenever he can. And although I do enjoy watching him performing all of his shtick here and there, within the context of this particular crime caper, it does seem overtly contrived and forced into the proceedings. Please note, I don’t want to sound like 'Mister Pompous Prick' were Martin’s performance is concerned. Oh no. Because he is just superb in that ‘Eddie Murphy’ type way of his. All I am trying to say is that within the confines of this story, his cartoonish antics is too extravagant and blatant. Also, his performance does take away from some of the supporting players by default-- as Paul, Nia, and Terrance’s roles do feel somewhat overpowered by Martins central figure. However, in the same breath, individually these three 'supporting cast members' do manage to stake their claim in a number of different ways. Paul uses his nervous demeanor. Nia uses her good looks. And Terrance is just one frightening b*stard. Heck, the only other actors who manage to match Martin with his OTT antics, are the other OTT characters! Such as ‘Momma's boyfriend’ and Anthony for example. Overall, ‘Big Momma’s House’ is a so-so film to watch. It's funny in places. The story is simple to follow. And in someway it is a mixture of 'Ms Doubtfire', 'The Nutty Professor', and 'Stake Out 2'. Plus in addition to this, it is a film that will take your mind away to cartoon-land for 90-minutes or so, allowing you to sit back, relax, and think about what I have just said, and then say to yourself ‘Well Lord have mercy, dat dam fool is right!’.